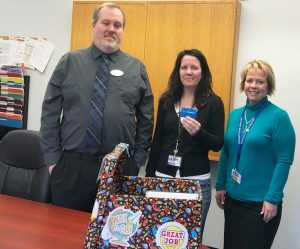 OSWEGO – Kingsford Park Elementary was the recipient of a donation of school supplies and a Wal-Mart gift card to help replenish needed materials for students. H&R Block office manager Randy Hoyt, left, is joined by Kingsford Park Elementary School fifth grade teacher Michelle Peterson, middle, and Principal Mary Volkomer, during a recent school supply donation drop-off, as part of the “Stock the Desk” program. H&R Block, Oswego, recently offered its “Stock the Desk” national promotion where people who had their taxes prepared at the business could donate school supplies or make a monetary donation to KPS. In For every person who mentioned the initiative and “KPS,” H&R Block gifted $20 to the school. While Hoyt thanked the pair for the opportunity to help the school, Peterson said all the gratitude is owed to Hoyt and the community for making this happen. Although she already can’t wait to have KPS partner with H&R Block for the initiative next year, she said some school employees will get together to figure out where supplies are depleted and where replenishment is needed.